Main purpose of this report is to analysis General Banking of Al Arafah Islami Bank Limited. Other objectives are to have exposure to the functions of general banking section and to know about the profile of AL-Arafah Islami Bank Limited. Report overall discuss on to know about performance of the Bank. Finally draw SWOT analysis and find out problems related on General Banking. Here also suggest recommendation on problems. To have exposure to the functions of general banking section. To know about the profile of AL-Arafah Islami Bank Limited. To know about performance of the Bank. In the light of objectives of the study the following variables are selected for analyzing the performance of the Bank. This report is aimed at presenting experiences gathered in the work place regarding the General Banking Activities. With this end of view I have collected data on the structure. The methodology of my internship report is described in the following paragraphs. For the data collection purpose, I have used several procedures. For the organization part basically it was observation and also I took the help of the Al-Arafah Islami Bank Limited. The data presented in the report is a combination of both the primary & secondary data. Annual report of the organization. Al-Arafah Islami Bank Limited was incorporated on 18th June, 1995 under the companies Act, 1994 as a banking company with limited liability by share. It started business on 27 September of that year with an authorized capital of Tk.1, 000 million. At inception, its paid up capital was Tk. 101.20 million divided into 101.200 ordinary shares of Tk. 1,000 each. 23 sponsors of the bank subscribed the total issued capital. In 2000 the paid up capital of the bank increased to Tk. 253 million, of which Tk. 126.50 million were paid by the promoters/ sponsors and Tk.126.50 million by the general public. The bank is listed in the two stock exchange of the country and has offered 126,000 shares for subscription and trading by the public. Al-Arafah Islami bank is an Interest-free shariah Bank and its modus operandi is substantially different from those of regular commercial banks. The bank however, renders all types of commercial banking services under the regulation of the Bank Companies Act 1991. It conducts its business on the principles of musharaka, bai-murabaha, bai-muajjal and hire purchase transactions. A Shariah Council of the bank maintains constant vigilance to ensure that the activities of the bank are being conducted according to the precepts of Islam. All activities of the Al-Arafah Islami Bank Limited are conducted of an interest-free system according to Islamic Shariah. It invests all of halal commondities and on a profit and loss sharing basis. A fixed percentage of income derived from investment of mudaraba deposits is distributed to the mudaraba deposit holders. AIBL was established not onoly to earn profit and to develop economy of the country but alsjo it had an ultimate goal to get reward in the Heaven by banning interest in business. The Islam loving people specially who are not interested with interest, should help this bank giving deposit and taking investment from this bank. The Bank is committed to contribute significantly in the national economy. It has made a positive contribution towards the socio-economic development of the country by opening 66 branches on which 16 authorized dealer (AD) throughout the country. The equity of the bank stood at 2,705.74 million as on 31st December 2008, the manpower was 1080 and the number of shareholders was 10,664. As an Islami bank, we are singular in every positive aspect. We provide a bunch of state-of –art banking services within the wide bracket of shariah. We are unique with our products, strict with our principle and uncompromising with our honesty. Here are some special features of us that make us notable in Islami banking sector. All activities of AIBL are conducted under a profit/loss based system according to Islamic Shariah to get the nation rid of Usury. In 2008, AIBL has included online banking in its wide range of services. Bangladesh software has been introduced in this feature to promote the local developers. AIBL regularly arranges its AGMs (Abbual General Meeting). Whenever needed EGMs (Extraordinary General meeting) are also arranged. We regularly pay dividend to our valued shareholders. For the year of 2007, we declared 20% bonus dividend to our shareholders. It is run according to rules and regulations formed and amended by Shariah Council. It is profit-loss sharing business organization. It provides loan as Quard Hasana for social welfare. No form of work is done which is non-Islamic etc. Al-Arafah Islami Bank Ltd means not business product but running business through money. Banks share sustained a steady strong position throughout since its inception at Dhaka & Chittagong Stock Exchange in1998.In Dhaka Stock Exchange the face value of taka1000 of our share was treaded at taka3099.50 highest in 2008. At the end of current year, the number of depositors stood at 243273 and the amount of deposit has accumulated to Tk.16775.33 million. The total numbers of investors are 13213 and total investment extended to them was a sum of total taka17423.19 million. The bank has earned Tk. 2172.48 million and incurred an expense of Taka1202.71 million in the current year. At the end of the year the profit before tax has stood TK.855.47 million, which is78.97% more than TK.478.00 million pre-tax income of the last year. The Bank Company Act, 1991, which amended in the march 2003, includes a provision of raising the capital to a new level of taka 100 crore for the commercial banks within March 2005. In compliance with the new provision, the bank has raised its capital from Tk. 41.58 crore in the year 2002 to TK.85.56 crore in 2003 by issuing a right share against each of the existing shares in the year 2003 and declared16% bonus dividend from the profit of the year2003. The bank again declared 15.50% bonus dividend from the profit 2004. As a result, the paid up capital of the bank stood at Tk. 67.79 crore as at 31st December 2005. The total balance of the reserve fund stood at Tk. 61.01 crore in the current year against 835.94 million compared to previous year 2006. The Bangladesh Bank has fixed the ratio of capital adequacy against risk-Weighted Assets at 9.00% in place of 8.00% in the month of September 2002. In 2002, the amount of total capital of the bank was 41.57 crore taka, which stood at Tk.104.27 crore in the year 2004 and taka 130.56 crore in the year 2005. This year it stood at taka 183.04 crore at the end of December 2006, the capital adequacy ratio of the bank is 10.71% against 12.17% at the same period of 2005. The total deposit of the bank was Tk. 16775.33 million at 31st December 2006, of which bank deposit was 611.72 million taka and general deposit was 16136.61 million taka. At the same period in the last year, the amount of total deposit was 11643.66 million taka. In this area the growth rate is 44.07%. At the end of the year 2007, the amount of investment of the bank was Tk.17423.19 million in comparison to Tk.11474.41 million of the last year 2005. The amount of investment has increased 5948.78 million taka within this period, which is around 5184%. At the year of 2006, the bank experienced satisfactory growth in the foreign trade. At the end of 2005, the total amount of foreign trade (export,import,remittance) was 18020.10 million taka, which has increased at 60.18% to reach 28865.00 million taka in 2006. The total export of the bank was 4932.90 million taka in 2005, which has increased at 85.34% growth rate to reach 9142.70 million taka in 2006, whereas the national growth was 85.34% during the same periods. Similarly the amount of import has increased from 12631.60 million taka of 2005 to 18821.40 million taka in 2006, experiencing a growth rate of 49.80%. Last year the amount of remittance through the bank was 455.60 million taka, which grows to 900.90 million taka in the current year. The bank was earned Tk. 471.19 million from other source than investment like commission income, exchange income, locker rent etc. In the current year which is 21.68% of total income. The bank earned Tk. 334.35 million from the same source in the corresponding period for the last year, which indicates 40.90% growth rate. The bank has paid the depositors 819.71 million taka, which is 70% of the investment income and 68.16% of total expenditure of the year 2006. The amount of this expenditure was 550.79 million taka in the last year. In this purpose the expenditure has increased 268.92 million taka or by 48.82% compared to previous year. The administrative and other expenses have increased by 8.29% in 2006, in compare to that of 2005. The administrative and other expenses were tk.353.68 million in the last year and it amounts to tk. 382.99 million in the current year which is 31.84% of the total expenditure. The bank has earned Tk. 969.77 million as operation profit during the year. In 2005 it was tk. 548.20 million. The growth rate is 76.90%. The bank has been paying dividends in every year from 1998 when it was established as a public limited company. The bank paid dividend at the rate of 15% in 1998, 12% in 2000, 7.5% in 2001, and 20% in 2003. Bank declared bonus dividend at the rate of 16%, 15.50%, 26%, and 35% to its shareholders in the year 2003, 2004, 2005 & 2006 respectively. A total number of 12 employees including 1 Assistant Vice President and 11 other Executives and officers have been working at the Audit and Inspection department under the direct Supervision of the Managing Director. To present the overall picture of the bank to the Depositors, Shareholders, Investment Clients and Well wishes in home and abroad more transparently and to adopt the developmental of the Information Technology of 21st century bank designed a web site for its own. The bank always kept a careful eye on the economic security and benefit of its staffs & officers. The bank operates a contributory provident fund a social security & benevolent fund and a gratuity fund for its employees. Till now a total of taka 1 crore has been paid from the fund to the families of late officers & staff of the bank. The bank has recruited experienced new manpower to coordinate its extended operation. The total manpower employed in the bank including managing directors is 771 at 31st December 2005, which were 912 at the end of the last year. Training and motivation are Utmost important to bring about positive change in the outlook of the manpower and to increase efficiency. AIBL has been training & various motivational program and incentives every year. Al-Arafa Islami Bank Ltd Foundation a portion of income of the bank is being spent on philanthropic activities. Among other philanthropic activities, running of Al-Arafah English Medium madrasa and library are praiseworthy. Al-Arafah English Medium Madrasa has been established by the Al-Arafah Islami Bank Ltd. Foundation with a view to building next generation, according to the ideas of peace and equality of Islam and to establishing banking and other aspect of life in the way of Islam. The prime aim of this madrasa is to contribute towards building human resource and in the broader sense to ensure human welfare. Library is the carrier & reservoir of knowledge. Al-Arafah Islami Bank Ltd. has shown that other than generating profit, it can also contribute significantly in the field of providing good source of knowledge by establishing a public library. Thus strengthening social is development. It is placed in sound, healthy surroundings. General Banking of Al Arafah Islami Bank Ltd consists of several types of services for their valued client. They provide various services to perform jobs with speed and accuracy to maintain of all affairs of banking in a uniform way to check fraud & forgeries as well as to fix-up responsibilities to satisfy their valuable customers. Deposit in Current account in Islami Bank is accepted under the principle of Al -Wadia. It means that the bank receives money in current account as Al- Amana (on trust). As such the bank is under obligation to return the entire money on demand by the customer and the customer in on way shall bear the loss which the bank sustains in its operation. The bank however, can use money at its risk with the prior permission from customer. As agreed upon by prior contract, the customer may also receive any benefit from the bank. In our bank, however, no benefit is given to the current account holder as per prior contract. The bank has also the discretion to recover the incidental charges for the maintenance of the account or any other services rendered. Two stamp size attached photograph duly signed by the acceptable introducer of the bank. Photocopy of passport/voter identity/commissioner certificate. Two stamp size-attached photograph duly signed by the acceptable introducer of the bank. Two stamp size-attached photograph duly signed by all parsons who will maintain the account. Along with above paper have to submitted certificate of commencement. Hajj deposits at monthly installment for any period from 1(one) year to 20(twenty) years are accepted under the above scheme to enable the account holder to perform Hajj. Under the above scheme, deposits of Tk.1.00 Lac, 1.10 Lac, 1.20 Lac, 1.25 Lac and multiple thereof are accepted for a term of 5(five) years and the bank gave profit thereon Tk. 969 per month per Lac and proportionately on the rest amount of deposit under the category during the year under review. The aforesaid rate shall, however, be adjustable at the close of calendar year on finalization of accounts. They have also Mudaraba Kotipoti Deposit Scheme and Mudaraba Double Deposit Scheme of various periodic. Fixed monthly installment for a particular period is to be deposited to defray the expenses of marriage and the bank allows double of Saving or Tk. 30,000 which is higher as investment to procure ornaments, furniture, fixture, etc. repayable in 24 monthly installment without any collateral security. Under this scheme the bank has introduced saving bonds for Tk.10,000, Tk. 100.000 for 3,5 and 8 years. After the completion of the tenure the deposited money may increase by 1.5 even two times, Insha-Allaha. Whenever a customer approaches for closing an account, he may be requested to submit an application mentioning the reason of closure of a/c along with the unused leaves of cheque book and pass book (if any) issued to him. The closing balance after recovery of incidental charges shall be paid through an unused cheque/ pay order. Bank rights to close an account. Pay in slip/ voucher is properly filled in i.e. with Title of A/c, account number if any date, particulars, if any and denominations of notes, amount in wards and futures. In cash of DD.PO.TT.TDR etc, particulars like name of payee, name of Drawee Branch if any, and date, have been given. All pay in slips/vouchers/application are signed by the depositor/preferably by the account holder in cash of deposit A/Cs. Cheque, voucher and instruments shall be received for payment of cash by an officer of the bank. While receiving the same, the receiving officer shall obtain the signature of presenter in his presence in the back of the cheque/ voucher / instruments. He shall encircle the signature of the presenter and shall attest the same under his signature to facilitate payment by the cashier after posting, passing of the same on obtaining similar signature in the back of the same. While receiving the cheque the concerned officer invariably look in to the instrument relates to the branch, not undated/ anti-dated/ postdated. An amount of cash payment shall be made by the cashier against a cheque/ voucher / instrument duly passed for payment under fill signature of authorized official(s) with in his /their passing power schedule preferably in red ink obtaining respective signature of the presenter of the cheque/ voucher / instrument as attested earlier by the receiving official as on acknowledgment of receipt of amount mentioned in the cheque/ voucher / instrument. In case of the signature does not conform payment shall not be made. Late payment of cash always discouraged as it involves risk. The instrument must be initialed by the manager authorizing late payment. The cheque must be posted in cash payment register in advance date. As soon as the business hour is closed all cash paid instruments/vouchers being again be checked and verified. The entries are in accordance with the amount of the instruments. The Cashier- in charge/cash officer shall prepare the cash position in cash position book adding the day’s total receipt with the balance of previous day and thereafter subtracting the payment of the day. Above when it will be assumed that the cash is balanced. Any shortage in cash balance must be recovered from the concerned official on the same day under intimation of the head office. Similarly any excess found in cash balance shall also be credited to sundry creditors A/C under intimation to head office. As per existing rules Bangladesh Bank License is required to conduct evening banking. It may be borne in mind that evening banking means receiving of cash from the customer in the evening hour. The keys of cash safe and strong room is retained by the Custodian and joint custodian records of keys is maintain in key register and the keys being duly received by the retainer under their signature and authentication of Manager. Bank received cheques/ instruments for clearing/collection. Cheqes received from customer which are drawn on other bank situated on the same locality (clearing house) and happen to be member of clearing house are treated as clearing cheque. Cheques/ instruments received for collection from upcountry branches/ other banks are known as Inward cheques for collection. In Bangladesh bank there is a very large room which contains fifty (50) is more tables for each bank that is called the clearing house. All the scheduled banks are the members of clearing house of Bangladesh bank. The following instrument are bringing brought to the clearing house. When parties of a branch place Cheque and other instruments of other banks the collection of these Cheque and instrument through clearing process is known as inward clearing. When Cheque of a branch come for collection through clearing process is known as inward clearing. Foreign trade can be easily defined as a business activity. This transcends national boundaries. These may be between parties or Government ones. Trades among nations are a common occurrence and normally benefits both the exporter and importer. In many countries international trade accounts for more than 20% of their national incomes. Foreign trade can usually be justified on the principles of comparative advantage. Accounting to this economic principle it is economical profitable for a company to specialize in the production of that commodity in which the producer country has the greater comparative advantage and to allow the other country to produce that commodity in which it has the lesser comparative advantage. It includes the spectrum of good services investment technology transfer etc. This trade among various countries causes for close linkage between the parties dealing. In trade the bank which provides such transactions is referred to as rendering international banking operations. International trade demands a flow of goods and payment are done through letter of credit L/C. Advising/ conforming setters (latter of credit). Issue of DD, TT, MT, etc. Payment of DD, TT, MT, etc. Sales and enhancement of foreign currency notes. Issue and enhancement of traveler cheque. Certificate of origin of goods. Foreign exchange risk is defined as the potential change in earnings arising due to change in market prices. As per Foreign Exchange risk Management Guideline, bank has physically establishment a separate Treasury Department at Head Office. Under the Treasury Department, Foreign exchange Font Office, Foreign exchange Back Office and Local Money Market have been physically demarcated. Duties and responsibilities of them have also been defined. All foreign exchange transactions are revalued at Market-to Market rate as determined by Bangladesh Bank at the month-end. All Nostro accounts are reconciled on monthly basis and outstanding entry beyond 30 days is reviewed by the Management for its settlement. Regulatory reports are submitted on time to Bangladesh Bank. The special feature of the investment policy of the Bank is to invest on the basis of profit – loss sharing system in accordance with the tenants and principles of Islamic Shariah. Earning is not only motive and objective of the Back’s Investment policy rather emphasis is given in attaining social goal and objective in creating employment opportunities. Bank must purchase the goods so that ownership of bank on the goods is established at least for a moment. There must three parties in order to perform buying & selling under Murabaha (a) Bank (b) Seller of goods (c) Purchaser of goods. Goods must also be halal as per shariah. A commodity in the true sense of the term must be involved in buying & selling. There must be an agreement between the bank and the Clint cost of the goods sold and the amount of profit added therewith should be separately & clearly mentioned in the MURABAHA AGREEMENT. It is a mode of investment under which the Bank at the instance of the client products Certain goods permissible under Shariah and the law of the country & sells those to the client at a price payable at fixed future date in lump sum or in fixed installments under this mode goods are delivered in advance and price is paid later agreed by the Parties. Goods are to be purchased from a third party excluding sister concern(s) of the client. Ownership of Bank on the goods must be established at least for a single moment before salling the same to the client. Like Murabaha, Bank is not bound to declare cost of goods and profit mark up separately. Since this mode of Financing involves inflow of cash over a considerable period of time, the discounting techniques can be applied to evaluate the acceptability of the project. Each and every expected installment payment should be converted to present value by applying the appropriate discount rate. The next step would be to sum up the present value of the streams of cash inflows and compare it with the purchase price. A proposal yielding a positive net present value would be accepted and otherwise rejected. The same concept applies while applying the IRR method. whereby the minimum expected rate of return is calculated which would equate the present value of cash inflows with the initial cash outflow. An investment proposal failing to yield this minimum required rate of return should be rejected. An investment product “Grameen & Small investment” is in operation. The objective of this project is to introduce Shariah based banking system in rural and village area, creating employment through financing to low income group, build up savings attitude, improvement of living standard of rural low income mass people, creating opportunity to carry out Islamic lifestyle by way of alleviating poverty and at the same time to make other financially established by investing in small investment projects. Initially this scheme was introduced in three branches of AIDL i.e Gallai, Comilla Ruposhpur Srimongal and Companion Comilla. There is a plan to expand this project gradually in other rural branches. The risk of Al-Arafah Islami Bank limited is defined as the possibility of losses, financial or otherwise. The risk management of the Bank covers 6 (six) Core risk Areas of banking I, e Credit risk management, foreign exchange risk management, Assets Liability Management, prevention of money laundering and establishment of Internal Control and Compliance and information & Communication technology. The prime objective of the risk management is that the Bank takes well calculative business risk while safeguarding the Bank‘s capital, its financial resources and profitability from various risks. In this context, the Bank took steps to implement the guidelines of Bangladesh Bank as under. Credit risk is one of the major risks faced by the Bank. This can be described as potential loss arising from the failure of a century party to perform as per contractual agreement with the Bank. The failure may result from unwillingness of the counter party of decline in his/her financial condition. Therefore, Bank’s credit risk management activities have been designed to address all these issues. The bank has an Investment (Credit) Risk management Committee at Head Office. The Committee reviews the Investment risk issues on monthly basis. The bank has segregated the Investment Approval, Investment Administration, Investment Recovery and Legal Authority. The Bank has segregated duties of the officers/executives involved in credit related activities. Recovery Officer. Their jobs have been allocated and responsibilities have been defined. The bank has implemented the Investment (Credit) Risk Grading Manual (IRGM) since April, 2006 which is made mandatory by Bangladesh Bank vide BRPD Circular No. 18 of December 11, 2005. Investment Officials of the bank have been trained on IRGM. Investment Risk Grading is incorporated in the Investment presentation from for all the cases. Usage of faster PC Bank software. AIBL follows the strong overview guidelines to through out the general banking assuming greater priority in view of the changes in the scenario of the banking practices due to liberalization, deregulatory measures and globalization of business and financial transactions. 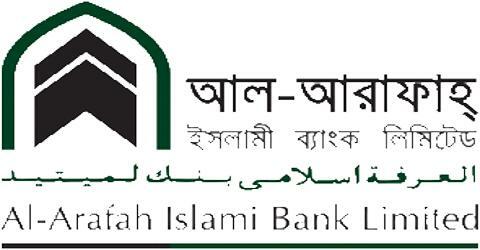 In compliance with the decision of Bangladesh Bank circular, Al-Arafah Islami Bank Limited has prepared risk profile in line with the guidelines and framework provided by Bangladesh Bank to customize in their existing framework to better manage the general banking to suit the new changes. AIBL has a great number of reliable clients to invest their fund and will be back in time. AIBL follows the most liberal process of disbursement process, which made the clients, inspires to take advance and help them to pay in time. They have interest free banking. They only receive profit of the goods. It has a lowest profit rate comparatively to other commercial bank, which is affordable for the clients. The have a significant role in social and financial development by investing like, masque, madrasa, grameen and small enterprise. The charge of PO, DD,TT etc can be exempted in the case of AIBL customers. AIBL can join to the western union money transfer. As a result, Money transfer from anywhere in the World to Bangladesh in minutes and money transfer between Bangladesh and any other part of the globe is safer and faster than ever before. AIBL can introduce debit card. So, people will feel more comfortable to expend money. When a customer opens a new account then a cheque book can be delivered at that time in name of welcome account with containing 5 pages. It is observed that bank executives have little idea about their customer behavior; attempts should be taken to bring customers orientation in banking management. Training programs should be undertaken to develop the interpersonal dealings of Bank employees. It is unanimously expressed that customers expect better dealings from Bank executives. It is noted that “delay in service” is one of the problems faced by Bank customers. Attempts should be made to strengthen the banking procedure. Front line cashiers may be empowered to entertain cheques up to a certain limit on an experimental basis which will save time and cost on the one hand and improved the banking service on the other hand. I have also noticed that AIBL has a better position for providing General Banking Services comparing with other private sector Banks. There is a word in business sector. “A company must diminish from the market when it ceases to serve its customer.” So it is necessary to provide quality of services to make customer satisfied. Thus, an organization can achieve its goal successfully.